It’s an easy stereotype to describe a story as being about stories. Postmodernism is the default dialect for a vast amount of contemporary genre fiction and it’s impossible to walk three steps without seeing a reference, an homage or a subtle nod to a previous traveler. Many books lean on that. 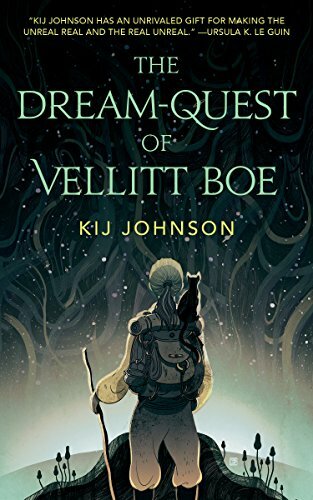 The Dream-Quest of Vellitt Boe by Kij Johnson, uses it to draw a different kind of map, and tell a different kind of story. To be clear, this is a Lovecraft mythos story. In fact it’s an indirect sequel to a couple of them. You don’t need to know either story in the slightest t her here and that’s the first blisteringly clever thing Johnson does. The setting, the constantly shifting Dreamlands, is both real and mapped into obscurity. The perfect location to nod to Lovecraft but surpass him, building different stories from the same material. The focus of that story is the second clever touch. Vellitt is a professor at a woman’s college in Ulthar, an establishment edging cautiously towards something approximating equality in a world where distance, reality and mortality are mercurial. You get a real sense of the college as a fragile, vital entity, a place built on compromise but intended to lead to something better for everyone. Until, of course, one student runs away. Vellitt, a former explorer and wanderer, volunteers to go after her and much of the book follows her journey across the Dreamlands. If there’s a speed bump in the book it;s definitely here. Some readers may struggle with the endless parade of squamous and rugosa Lovecraftian creatures and the slow, but constant pace of Vellitt’s journey. Most, however, will love it. Vellitt is a wonderful lead character, an older, mature, wry explorer who finds herself walking the paths of her past as much as those trod by her errant student. She has a touch of the Lara Croft’s by way of Dame Judi Dench. A tremendous love for adventure and travel coupled with a rock-solid sense of duty and morality that never feels sanctimonious. Vellitt quietly rather enjoys her newly disreputable job and she’s an able tour guide across the blasted, nightmarish and often beautiful world of the Dreamlands. But it’s the exact nature of that job, and what happens when she reaches her destination that’s truly fascinating. The book’s conversation with Lovecraft’s attitude towards gender and race is a constant undercurrent but it’s the final act where it, and Vellitt, come into their own. Her arrival in the real world, which is presented with a lyrical flourish and elegance that few authors could accomplish, puts the entire world she’s just left in context. The Dreamlands are infinite, mutable and fundamentally limiting. The waking world is smaller, fixed and sings with a density of information and possibility that’s impossible to resist. There’s a moment where Vellitt describes Lovecraft character Randolph Carter as painfully aware of being the lead in his own story. That’s nuanced, complex analysis and character work. It honors Lovecraft’s near boundless creativity, accentuates the faults in his work and places it, Carter and the all the rest in a modern context. As a fascinating, enticing foreign country. One we visit but, if we’re lucky, we don’t stay in for long. Complicated, intimate, thematically loamy and curiously hopeful work from one of the best writers in the field today. The Dream-Quest of Velitt Boe is available now.